Hey Smartphone Lovers, Here is a big news for you guys. There is Rumors around that sunsung might lunch it,s new flip-flop phone of W series W2018. The perfect Flip-Flop phones are coming back in the market, and for this, we must have to thank the South Korean company samsung, the tech giant Samsung. 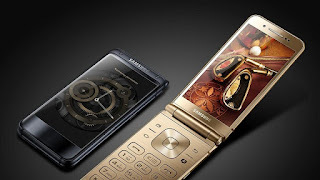 As Earlier there were reports that Samsung is working on its new flip flop phone, after the company has been launched the Samsung W2017 flip flop phone in China in November 2016. Apart from rumors of Samsung Galaxy Note 8, the new leak News came online about the new Flip Flop phone. The device may come in the company’s ‘W’ series. Some of the specifications are also leaked of the new Samsung device. A few weeks ago, the new clam shell phone dubbed as the Samsung W2018 and was spotted on TENAA benchmark site. As per the leak news, the device has the code number ‘SM-W2018’. And the Specifications in which it has, it can be a top-end model as it is said, it has sport the flagship smartphone processor, Qualcomm Snapdragon 835. And with the processor will be 6GB of RAM. Till now, Samsung has launched its Galaxy series phone, Samsung Galaxy S8+, and Galaxy C9 Pro with 6GB RAM. Beside that, the new flip flop phone will have an inbuilt storage of 64GB.From the last list of TENNA. TENNA is a Chinese certification website, the flip phone will have a 4.2-inch display. And it also has The second display is on the outside Flap so the user can still open their content on the screen even after the flip is closed. The new smartphone device might have a 12MP rear camera with LED Flash and 5MP front camera. The flip flop phone will have the battery strength of 2300mAh. The device may will run on Android Marshmallow 6.0.1 or may be with latest Nougat 7.1.1, with TouchWiz UI on top. It is said that Samsung will launch the W2018 flip-flop phone first in South Korea than in the other Regions.The New device may will have the connectivity options like Bluetooth, Wi-Fi 802.11 b/g/n, GPS or A-GPS and also it will be 4G VoLTE supported. And for sharing external files and charging it will have micro-USB port. According to Chines Website TENNA, the Samsung Flip Flop “W2018” will come in only one color option which is Black with the dimensions of 122 x 60.2 x 15.5 mm. The device will be 155g in weight. The source also said that the Samsung would release an another flagship phone but not in Galaxy Brand. This is an another surprise for everyone as we know almost all Samsung phones came under the Galaxy brand by the company. 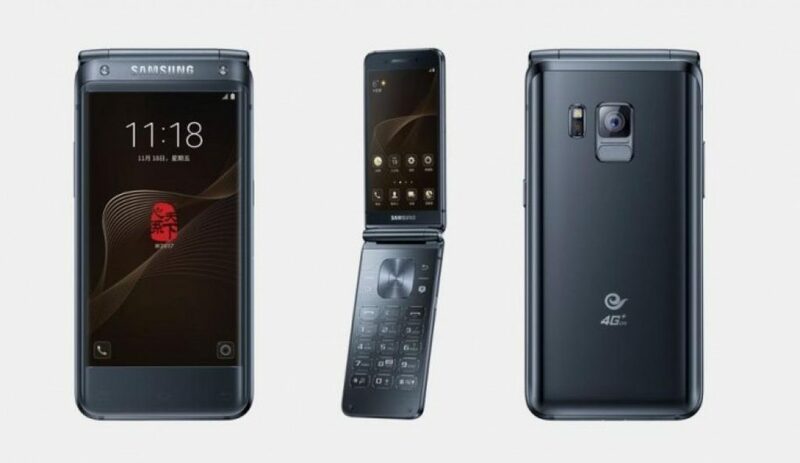 It looks like the brand maker of the smartphone South Korean now working on another clamshell device with a model number SM-G9298. This could be different from the existing Flip flop series phones like W2017, W2018 clamshell phone. At present, the company is focusing on the New Galaxy Note 8 phablet. And a few days ago the company already announced the launch date of Galaxy Note 8 phablet. As Recently, there were rumors that the device will be introduced on 23rd of August on the ‘Galaxy Unpacked’ event. same date in which our new indian jio phone might be launch. Now let’s check out brief listed the full features of the Samsung flip flop W2017 which was launched in China last year.